BOSTON -Half of the members of the Waltham Hawks weren’t even alive the last time the school won a state championship in hockey in 2002, but that didn’t stop head coach John Maguire from breaking out every possible reminder of the past along the way for the current group. 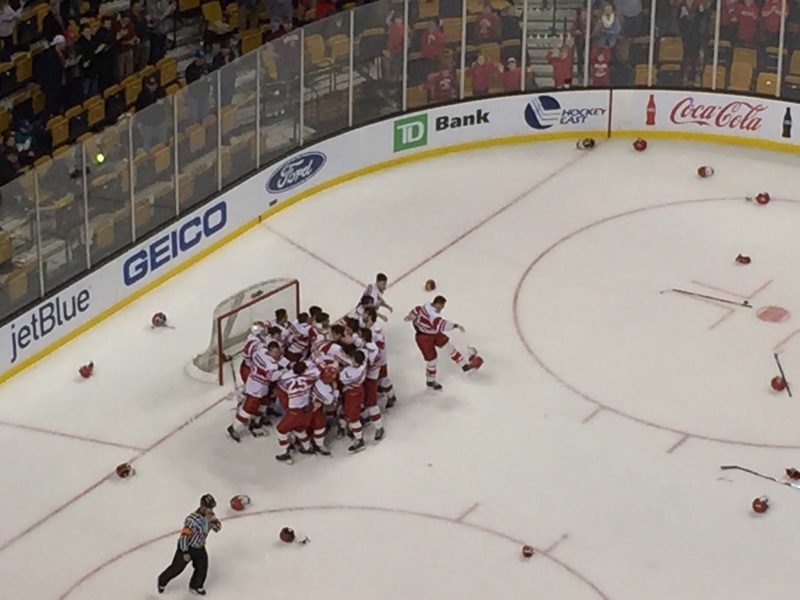 Relishing the past created the perfect present for Waltham, which skated away from the Marshfield Rams for a 4-1 win in the Division 1 State Championship game on Sunday night at TD Garden. The Hawks (18-5-2) never trailed against the Rams (15-7-5), leaving the rest up to goaltender Kyle Penton. The senior netminder ended his career with a bang, turning aside 33 of the 34 Marshfield shots flung in his direction. Maguire said that he had several members of the 2002 title team, which defeated Springfield Cathedral 3-2 in overtime, come back and speak to players of the current outfit during the course of the postseason run. Chris Macinnis, now an assistant coach under Maguire, was a freshman when the Hawks won it all 16 years ago. He’s been boasting his championship ring to the players at practice, Maguire said. It all would have been for naught if Chris Egan, Andrew Miller, Declan Reynolds and J.T. Logue hadn’t scored for the Hawks. Egan scored the lone goal of the first frame, putting home a rebound at 7:24 to give Waltham the lead for good. Miller buried a pass from Reynolds to give the Hawks a 2-0 lead in the second, but it was Reynolds himself finding the back of the net that really made Waltham’s championship dream a reality. As Hawks senior defenseman Gerard Jelloe pointed out after the game, a 2-0 lead is the worst lead in hockey. “I knew we had to come out and get a couple, at least, in this last period,” Jelloe said. Sure enough, a mere 13 seconds into the final period, Reynolds beat Marshfield goaltender Nevan Costello for a 3-0 Hawks edge. Costello made 15 saves in a losing effort for Marshfield. Max Burum grabbed one back for the Rams, knocking one in off his foot to give Marshfield a pulse at 8:57 of the third. Logue’s insurance goal all but signed, sealed and delivered the title to Waltham at 11:35 of the third, a coronation of the historic season for the Hawks. Waltham, winners of the Division 1 North region as the No. 4 seed, wound up outscoring teams 15-3 along the way to its title, only its 3-2 semifinal win in overtime over No. 8 Belmont ever perhaps in doubt. A year after making the first Super Eight appearance in program history, Marshfield’s encore ended with a loss at the Garden. When asked if he thought on Day 1 of the season that the Rams had a championship run in them, head coach Dan Connolly said that he believed in his guys and they believed in each other, and that was all that mattered.